immersion or infusion (pouring). Immersion is the more ancient practice of the Church and was the only way in which persons were baptized until the 14th century. The practice of pouring water over the head of the individual became popular in the Middle Ages when the sacrament was seen more as a purification and washing away of sin. Since Baptism is the sacrament of initiation when we “die to self and are raised to new life” in Christ, immersion is the preferred method. 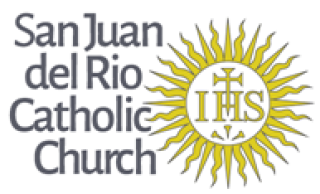 Click here for more info on baptizing your family member at San Juan Del Rio Catholic Church. Reconciliation is also available anytime upon request. Reconciliation services are also held one evening during Advent and one evening during Lent. The Sacrament of First Reconciliation is taught in the 2nd grade level. However, our Religious Education Sacramental programs are two-year programs. This means a child must be in a Religious Education program one year directly prior to Sacramental preparation. To read how a parishoner performs this sacrament with a Priest click here. The Sacrament of First Holy Communion is taught in the 2nd grade level. However, our Religious Education Sacramental programs are two-year programs. This means a child must be in a Religious Education program one year directly prior to Sacramental preparation. The Sacrament of Confirmation is taught in the 8th grade level. However, our Religious Education Sacramental programs are two-year programs. This means a child must be in a Religious Education program one year directly prior to Sacramental preparation. Weddings are by appointment. Please contact the parish priest at least 8 months before the wedding date. All couples must participate in the Engaged Encounter program sponsored by the Diocese. For more information about being married at our Parish, click here. A sacrament is an outward sign established by Jesus Christ to confer inward grace. In more basic terms, it is a rite that is performed to convey God’s grace to the recipient, through the power of the Holy Spirit. The anointing of the sick conveys several graces and imparts gifts of strengthening in the Holy Spirit against anxiety, discouragement, and temptation, and conveys peace and fortitude (CCC 1520). No. The Catechism says, "The anointing of the sick is not a sacrament for those only who are at the point of death. Hence, as soon as anyone of the faithful begins to be in danger of death from sickness or old age, the fitting time for him to receive this sacrament has certainly already arrived" (CCC 1514). The elderly can be anointed because of the aging process; those with serious illness, either physical or mental, and those who will undergo surgery soon. A person does not have to be in great danger of eminent death, but because we all should be ready to die when our Lord calls us home, those people who fit into any of these three categories should not postpone requesting the reception of this Sacrament. The Sacrament of the Anointing of the Sick is for the living. If you would like to receive this Sacrament, please contact the Parish Office at (904) 287-0519.